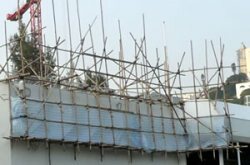 Bamboo scaffolding is used extensively around the world because of its high level of flexibility and strength. 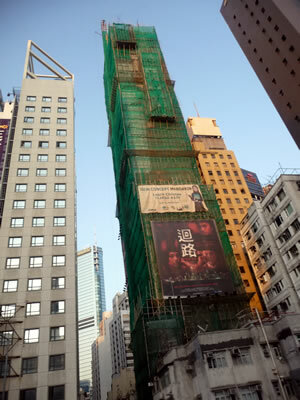 You can see some examples of this in the photos dotted around this site, some of which were taken recently in Hong Kong. In many countries bamboo is relied on for a main building and scaffolding material in construction projects. Countries that have tropical climates and forests of the species of giant bamboos are in a position to grow and harvest bamboo to maintain this long tradition of using bamboo for construction. There is no reason why these plants could not be grown in the same way across much of the globe to replace the use of other less sustainable products such as hard woods. Bamboo materials have a tensile strength of 28,000 per sq inch compared to 23,000 per sq inch for steel which is the traditional western country scaffolding material. It is exactly the strength and sustainability of bamboo construction products that has led to a higher level of appreciation for their usefulness and versatility in modern day design and building projects across the world in countries that some years ago would not have considered this material. Bamboo could be grown and harvested to use for scaffolding in western countries as a replacement for steel, and in building projects as a replacement for hard wood. Construction products technology has improved so that bamboo can be used in the erection of many types of buildings and structures. Some examples are; flooring, roofing, tiles, joints, treatments, concrete, and types of plasterboard. Significant research in developing corrugated mat roofing sheets has been done in India by the Indian Plywood Industries Research and Training Institute, along with research into concrete by the Bamboo Development Agency. This is really helping to push use of bamboo materials into an exciting future in the construction industry for building using bamboo. In earthquake regions this is an essential material for construction due to its flexibility and ability to withstand earthquakes. It has been demonstrated that these flexible and lightweight buildings stand in the face of an earthquake even when extreme and violent shaking occurs. Reference: 1992 earthquake in Limon, Costa Rica. Scaffolding video that includes some very quick shots of other products made from bamboo.